Got A Business? Have A Website? 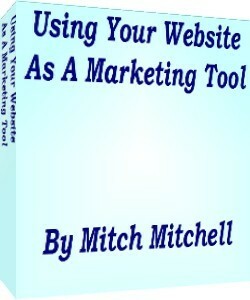 Would A Website Marketing Tool Book Help? Are you in business and wondering whether or not you should have a website? Or do you have a website and wonder if you're using it properly? just might have some of the answers you need. It's short and sweet. In just over 50 pages you'll learn just how you can use a website to help you market your business. You'll learn ways you can use your website that you may never have thought about before. You'll learn terminology that web designers use when talking to you about web design. My name is Mitch Mitchell, and I have worked with many small and medium sized businesses and individuals ot help them learn the basics of online marketing. I've worked with them to figure out how they want to represent themselves on the internet. I've been doing this for years, and clients have been happy with how I've helped them learn how to represent themselves better on the internet. My purpose in writing this website marketing book was to give some insight as to what it takes to help a website gain prominence online. It can be time consuming and challenging, but it can also help get you business at home and worldwide. No matter the size of your business, you can only benefit from having a website. I've written articles about it and I have an outline that highlights major points. With a website, you can market to the world in a more cost effective way than anything else you can imagine. You can do commerce online, even if you don't have products to sell. You can dole out more informative than regular print materials. And there's plenty more in this ebook! I also tell you why you may not be ready for a website, or why some aspects of having a website might not be for you. After all, an improper website could represent your business in unflattering ways; no one wants that. Who's this book for? If you don't have a website, this book is for you. If you're not using your website effectively, this book is for you. If your website is poorly designed, this book is for you. If you paid someone to do a website for you, but had problems understanding the terminology they used, this book is for you. I've tried to make it easy to understand. I've been concise. I haven't gotten into a lot of filler. This isn't a college course; it tells you just what you need to know and consider, whether you have a website or not. If you're searching for a clear and concise roadmap to decide how to build a winning Web site and market it online and offline, you'll benefit from Using Your Website as a Marketing Tool. I often speak about Web sites at business events and found this tutorial to be incredibly indepth, with samples and definitions, than comparable books in print. Words such as SEO, black hat, and keywords are explained in plain language. You'll be more than satisfied with Mitchell's tutorial, and best of all, you'll immediately be ready to create a Web site and marketing plan. a division of T. T. Mitchell Consulting, Inc.